Hong Kong has a high degree of urbanization and the night sky is lit up by artificial light. However, under good weather conditions, bright celestial objects in the sky are still visible. In this issue, we are going to introduce four planets to you. They are relatively bright and can be clearly seen in the urban area. Since the distances between the planets and the Earth keep changing, the position and brightness of each planet as viewed from the Earth keep changing as well. We have to understand the movement of these planets before planning an observation. When Venus is near to its greatest elongation, it will become the brightest star in the sky. Some people may mistakenly think that it is a "UFO" due to its brightness! Since Venus is located within the orbit of the Earth, it will appear near the western or eastern horizon only during sunset or sunrise. During its greatest elongation, the angle between Venus and the Sun reaches a maximum of around 45 to 47 degrees. There are two types of greatest elongation. 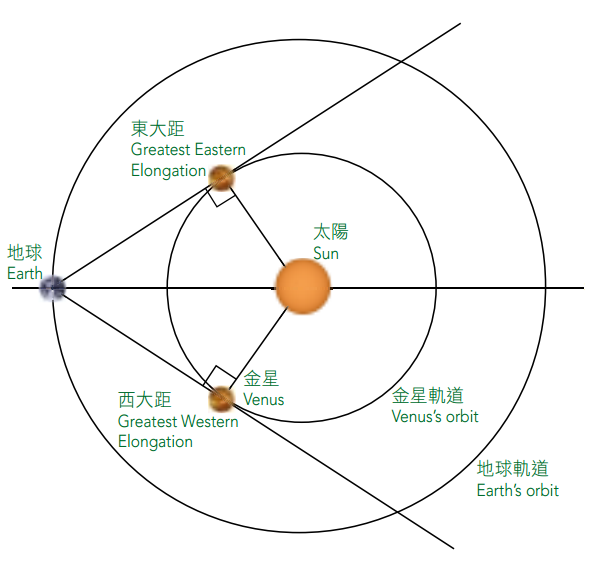 When Venus reaches its greatest elongation to the east of the Sun, it is called the "Greatest Eastern Elongation of Venus". At that time, Venus will appear in the western sky after sunset and become very bright. During the period from November 2016 to February 2017, the elongation of Venus will reach almost 40 degrees or above and Venus will look very bright. The bright Venus is visible in the western sky after sunset. Mars is a star that appeared in red color. The best time to observe it is the time during the astronomical phenomena "Mars Opposition"**, which occurs about every 26 months. Since the orbit of Mars is elliptical, for every 15 to 17 years, an opposition will occur when Mars reaches its closest position to the perihelion, which is called the "perihelic opposition". At that time, Mars will be much closer to the Earth and it looks much brighter. The next perihelic opposition of Mars will occur in 2018. 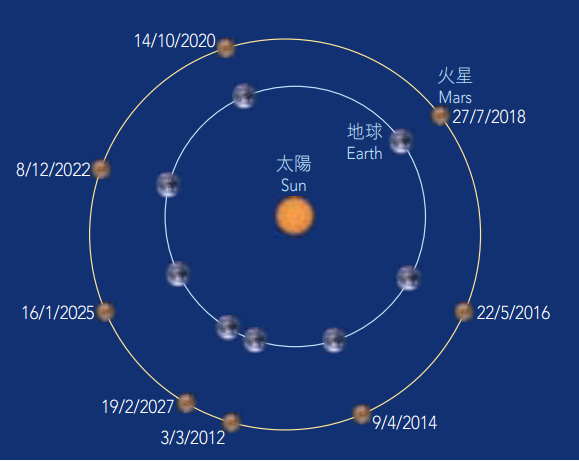 During the Oppositions of Mars from 2003 to 2018, the Earth and Mars are at different positions. Sometimes they are closer to each other. 1 arc second is equal to 1/3600 degree. So even during the perihelic opposition, the apparent size of Mars is less than 0.01 degree. It is impossible to see the disk of Mars with the naked eye. In fact, it is not necessary to wait for the opposition to occur to observe Mars. At other times, Mars is still visible though it is not very bright. Same as Mars, Jupiter and Saturn are located beyond the orbit of the Earth. Therefore, the best time for observing Jupiter or Saturn is when the opposition of Jupiter or the opposition of Saturn occurs. However, as both planets are far away from the Earth, the differences between their oppositions are not significant. Also, since the orbital periods of Jupiter and Saturn are long, an opposition of Jupiter and an opposition of Saturn occur about every 400 days and 378 days respectively, which can be counted as two annual astronomical phenomena. Since the Sun and the planets almost lie on the same plane, the planets are always near the ecliptic (equivalent to the plane of Earth's orbit) when viewed from the Earth. In the night sky, there is a difference between the planets and other stars. The planets do not twinkle as other stars do. It is because the Earth and the planets are much closer. The light from a planet is actually a tiny beam with a measureable area. Normal atmospheric turbulence will not cause changes in that beam, and therefore the light of a planet is steady. If tonight's weather is fine, would you like to go outdoors and take a look at the planets? 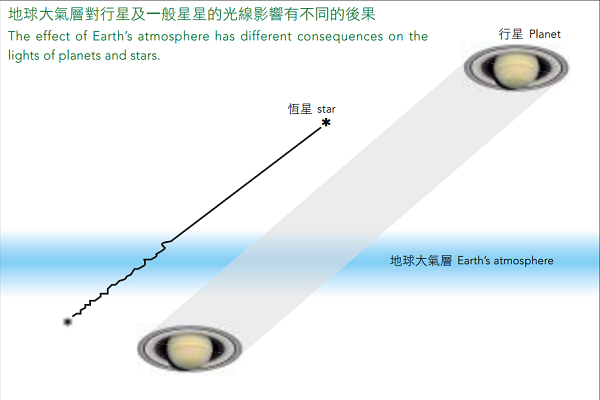 The effect of Earth’s atmosphere has different consequences on the lights of planets and stars. Apparent magnitude is a value to describe the brightness of a star. A lower value represents a brighter star. Most of the bright stars in the night sky are between magnitude 0 to 1. Sirius, the brightest star in the night sky, has a magnitude of -1.4. The magnitude of a full moon is -13, and that of the sun is -27. When the Sun, the Earth and an outer planet are nearly in a straight line, and the Sun and the outer planet appear on the opposite sides of the Earth, it is called “Opposition”.